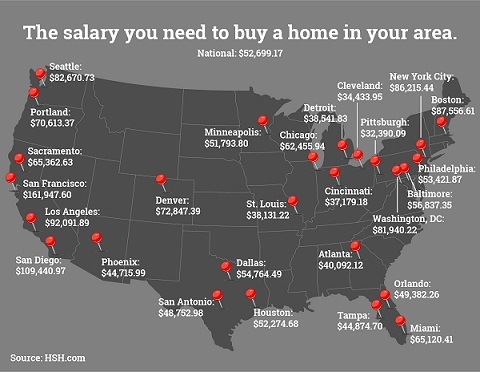 What salary do you need to afford a home in your city? How does your city rate in terms of home affordability? A recent report by HSH.com determined the salary families would need to make in 27 metro areas in order to afford the local median home price. The study assumed a down payment of 20% and operated under the standard that a monthly mortgage payment shouldn’t exceed 28% of the borrower’s income, according to the Huffington Post. San Francisco residents need the highest salary if they want to afford a home, according to HSH.com. In the San Francisco metro area, a buyer with a 20% down payment would need to make $162,000 a year to afford payments on a median-priced home. Pittsburgh, Penn., meanwhile, was most affordable; homebuyers there could meet their mortgage payments with only a $32,400 salary. HSH.com found that home prices have gone up since the first quarter in every metro area surveyed except for Tampa, Orlando and Miami. Nationally, the median home price was $240,700, about a 10% increase from the first quarter.